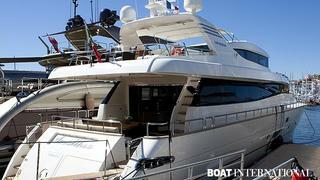 Canados has recently delivered a full-custom version of their successful Canados 86 series. Called Amalthea, this 26 metre motor yacht fulfils all the demands of her owner. Presented during the Festival de la Plaisance of Cannes this year with the new Canados 120, Amalthea is very different from her numerous sisters. Following the owner's wishes - a master suite on the main deck and an enclosed area on the sundeck - Canados decided to create a third deck, making Amalthea the only Canados 86 trideck existing to-date. This modification considerably increased the volume inside for a yacht of this size. The yacht accommodates a total of 8 guests in the master suite forward on the main deck, with a double and two twin cabins on the lower deck. The large wheelhouse is on the bridge deck, with an office for the owner behind, like a veranda with a direct access to a protected sundeck. Special features also include a sauna in the beach club. According to the shipyard, the few extra tons due to the modifications have only a limited impact on performance, reducing the top speed by a couple of knots. In the standard version, the Canados 86 is powered by twin 1,800hp Caterpillar engines giving a cruising speed of 29 knots and a top speed of 33 knots. Entirely designed by the yard, Amalthea demonstrates the ability of Canados to tailor their production to specific demands.